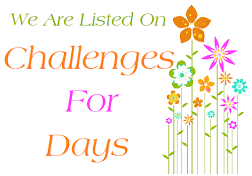 Are you ready for a great challenge? Good, we've got one for you. but it makes for a great card formula! on just 1/3 of the card, and keep it clean and simple. Shall we chat about what the winner gets??? the winner of this challenge will also get a yummy prize from our fabulous sponsor! The goal of Loves Rubberstamps is to bring you only the best papercrafting products, from your favorite companies (or soon to be new favorites), at the best prices we can offer. And now...Let the Inspiration Parade Begin!! Featuring CAS-ual Fridays Stamps and Fri-Dies! has 3 splashy stars and 3 cool score lines! used 3 different sentiments, each with 3 words! 3 punched circles with 3 rad sentiments! 3 words, 3 colors, 3 dots on an "i"
This is such a great challenge! Thank you! I really wanted to play along with your fun challenge--it's been awhile. Hoping to get another card done. Not sure if this one qualifies, but thought I'd let you decide. what a fun and thought provoking challenge! excellent inspiration from the DP! Thank you for posting this challenge and for showing us the brilliant cards made by your DT members. I do hope my card is eligible for your challenge. Thank you for the beautiful inspiration and the fun challenge! !